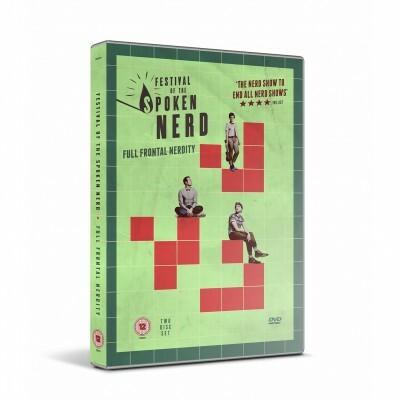 Last week I finally cleared out my inbox and among lots and lots and lots of mailing lists, ads, and other irrelevant things I found the review copy of Festival of the Spoken Nerd‘s Full Frontal Nerdity, which has been on sale for WEEKS now. Whoops. I watched it almost immediately after rescuing it from the depths of my inbox, though, and am writing this review soon after, to make up for lost time. In lieu of a spreadsheet, here is my review in a simple list format. If you want to understand all the references, you’re probably going to have to watch the show yourself. BONUS: To answer the audience question, the nerdiest thing I have ever done in London is organize a walking tour of DNA helices. BONUS: Nerdiest thing that happened while watching this DVD: A glass of chopsticks fell from the book case and I immediately thought it was caused by a toroidal vortex, but actually it was one of my Giant Microbe plushies which had fallen from the shelf above it and knocked over the glass. It fell because I had just bought a new one and the microbe plush toy collection corner was getting too crowded. If you like nerdy jokes, music, science and spreadsheets, you will love this DVD. If you love all those things but hate DVDs, you can also get a digital download of the show (with or without extras), or a T-shirt that says “NERD” in binary code. Festival of the Spoken Nerd’s current touring show is Just for Graphs, which has show dates across the UK all autumn. The video below includes clips from Full Frontal Nerdity as teaser for the new show.